Belle Haven they called it. Belle Hell, I say……. Dabney Beale returns to Belle Haven in the spring of 1920 out of utter despair. Orphaned, penniless, and expelled from college, she is forced to seek refuge at the family estate. A proud house, it was renowned for its splendor, its hospitality and the beauty of the four daughters whose portraits still adorn the walls. All excerpt one…. 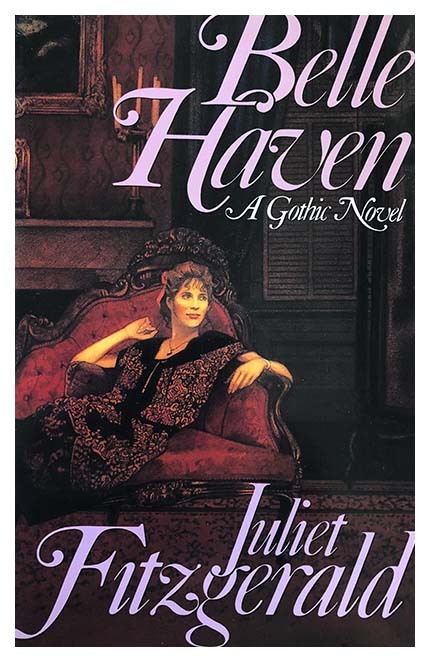 Now like a rusty jewel set in Virginia’s famous horse country, Belle Haven has fallen into a state of decay at the hands of Dabney’s Aunt Charlotte–a woman known for her beauty and her tyrannical power–her alcoholic husband, Austin, her evil lover, Eugene, and their retinue of strange servants. The estate, like Dabney’s own life, has become a mockery, a monument to dashed hopes and disillusionment. In the face of Charlotte’s relentless scorn, Dabney finds peace only in the seclusion of the Belle Haven lake, away from the intrigues of aunt’s depraved household. The lake becomes her refuge–and the setting for a chance meeting with a handsome young doctor that will change both their lives. Like Dabney’s, Bay Hamilton’s fate has ben cruelly altered by Charlotte’s careless passion. Trapped by old loyalties, he can never forgive Charlotte’s trespasses. Yet, neither can he forget Dabney Beale. On the night of the gala Belle Haven ball, the inescapable depravity bred into the very bones of her family will erupt in a single violent act that will leave Dabney utterly alone confronting the evil that lurks within Belle Haven.